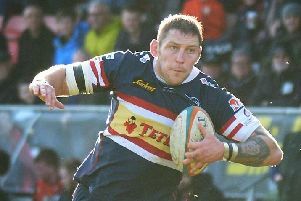 Doncaster Knights, who will be boosted by the return of skipper Michael Hills, will be aiming to bounce back after successive Championship defeats when they take on Jersey at Castle Park on Saturday (2.30pm). Knights go into the game on the back of a 20-15 defeat against Nottingham at Lady Bay last Friday in a game the coaching staff felt they should have won – even more so after watching the match DVD. “I watched the game several times over the weekend and every time I watched it I got more disheartened because it was a game we really should have won because they hardly did anything and we looked dangerous every time we got in their half,” said head coach Glen Kenworthy. Kenworthy and backs and skills coach Paul Cooke also made the players watch the game – during which they highlighted individual errors – when they reported back for training on Monday. “The boys were really disappointed with the performance and it didn’t make for pleasant viewing,” said Kenworthy. “It was brutal session but that’s what we wanted it to be. Having had a full week in which to prepare Kenworthy is hoping that it will be a different Knights on show. “We need to win the game; it’s as simple as that,” he said. “We are looking to put in a performance (for the supporters) but I’d take a (scrappy) 3-0 win right now. The Chanel Islanders, who finished strongly to claim fifth spot last season, survived a late three-try rally to claim a 30-26 win at Castle Park on the last day of the campaign. They have failed to carry on in the same vein of form at the start of the current season and had lost all three games prior to beating Yorkshire Carnegie. Knights were due to finalise their side today after checking whether any of the players who resumed training yesterday after injury yesterday suffered any adverse reaction overnight and also several players who were sent home with a bug at the start of the week.